If there's one sport that Filipinos are so crazy about, it's probably basketball. Today, my team mate just revealed he had 3 different basketball uniforms on hand. Within this week alone, he's playing in a lot of basketball games in different teams. 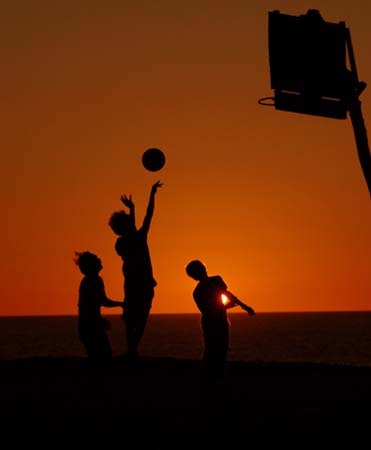 Basketball in the Philippines is played practically everywhere. There's probably the neighborhood hoop near your house, a basketball court on the church grounds or school premises, and we all know everyone's hooked to the TV when NBA or PBA finals are up. College kids go to great lengths to cheer for their universities in the UAAP. Even my colleagues at the office set up Ateneo vs La Salle teams just to add more spice into their usual basketball games. How crazy about basketball is that? When one travels around the world, do Filipinos play the same sport that other countries do? A quick search at the ever reliable Google delivered me some answers. Over at Ezine Articles, football/soccer is said to be the most popular sport in the world. The next most popular sport is all about cricket. This seems to be popular in the UK, Australia, New Zealand and India for Asia. The third most popular sport is tennis. My mom will hog the TV once Federer is on in the latest Grand Slam tennis tournament. Tennis is said to be popular in the richer countries like US, Australia and Europe. There are only a few Asians that have made it to the major tennis tournaments. I wish Filipinos were more successful in sports. I hope someday we'll also be recognized for basketball as much as the world recognizes Manny Pacquiao for boxing. @arjaeuse: thanks for the tip! i do include pics in most of my posts :) i'll try my best to put more. Alam mo ba na ang mga basketball courts lalo na sa provinces eh nagiging "rice dryer" pag anihan? hahaha. Nung nag-audit ang COA sa isang province na supposedly bumili ng mga rice dryers eh puro basketball courts ang nakita. Dun daw kse pinapatuyo ang palay. Happy New Year & more travels to come! @kegler747: haha grabe talaga basketball courts, priority ng pinoys! love talaga ng pinoys ang basketbol. kahit saan kahit kelan basketbol. kahit umaga, kahit gabi basketbol.